On a lark, I’m applying for a position for a job with MLB.com. The job will be to watch every game of the upcoming season and blog, vlog, and write about everything that I see. I know the odds are slim, but I’ve always said that if the chance came along to write for a living I would go after it, so I can’t justify ignoring the chance now. The application process requires you to write 2 essays with a 500 word limit. The first essay asks you to tell about yourself and explain why you love baseball. The second gives you a choice to predict some award winners and explain your logic or you can predict the biggest storyline of the year and explain why. I’m going to post both essays because it’s what I’m writing today instead of my previously planned article. Hope you enjoy. I can remember the year 2000 like it was yesterday. Will Clark, my all-time favorite baseball player, was exceeding all reasonable expectations and finishing his career with a bang. 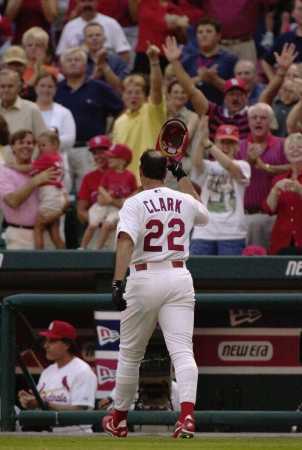 Clark hit .345/.426/655 in 51 games for the Cardinals that year as they pushed towards the post-season. I was 23 years old and was just beginning to mature into the man I am today. Clark’s performance that year brought back memories of the 1989 season, the year that I first took an interest in baseball for myself. I remember growing up in Atlanta and going to Braves games with my father in the early 80’s, but the game didn’t capture me at that point. It was in 1989, a few years after my father left, that I was caught up in magic of the game. I remember spending countless hours comparing the lineups of the Giants and A’s in the days leading to the World Series. Who was better, Clark or McGuire, Mitchell or Canseco? I was hooked. As the years rolled on we didn’t get many Giants games in Atlanta and later in Jacksonville, but whenever ESPN or TBS was showing my guys it was must see TV. After Rick Ankiel’s meltdown cost the Cardinals the 2000 NLCS and Clark retired I found myself without an anchor to baseball for the first time in 11 years. I realized that I couldn’t let this happen again. I didn’t need another favorite player, what I needed was a favorite team. I needed a team that I could root for regardless of who came and who went. I started looking for a team that offseason and before I knew it I had given my heart to the Tampa Bay Devil Rays. My only other choice would have been to go back to the Braves, but then I would have been stuck with the hated label of a bandwagon fan. That was unacceptable, so I put my faith in Vince Naimoli and Chuck Lamar. Things could have been better. I paid my dues as a Rays fan and was finally rewarded with the 2008 pennant run. During the intervening time I also managed to become a responsible adult, get married and forge a successful career at Blue Cross and Blue Shield of Florida. Don’t tell my wife, but the highlight of it all was the 2008 pennant run. That will be our little secret. In the end, the thing that I love most about baseball is its timelessness and its permanence. Baseball discussions routinely involve topics from the beginning of the 20th century and will continue in that vein for as long as you we can imagine. I look forward to the days of the future when I can tell my kids about the amazing Albert Pujols, the magical Derek Jeter and the resurgent Will Clark. Most of all, I can’t wait to share the game with them and watch them create their own memories. Posted on February 19, 2011, in Sports and tagged Baseball, St Louis Cardinals, Will Clark. Bookmark the permalink. 1 Comment. I’m still astounded at the number of people who don’t love baseball!! It’s just as much fun to play as it to watch. Go Yankees!